Breaking: Court orders FG to release ex-NSA, Dasuki, forthwith - SWANKYLOADED OFFICIAL BLOG. ABUJA—-The Abuja Division of the Federal High Court has ordered the Federal Government to release the detained former National Security Adviser, NSA, Col. Sambo Dasuki, retd, forthwith, declaring his continued detention as illegal. Former national security adviser of ex-president Goodluck Jonathan, Sambo Dasuki (R), speaks with his lawyer Ahmed Raji, during his trial at the federal high court in Abuja, on September 1, 2015. The court, in a judgement that was delivered by Justice Ijeoma Ojukwu, held that FG failed to justify why it has kept Dasuki in detention for over two and half years. It dismissed FG’s claim that the ex-NSA was being detained for the sake of national security and over alleged role he played in the illegal diversion of $2.1billion meant for the purchase of arms to fight against Boko Haram. “The allegation of money laundering does not ipso facto affect the national security”, Justice Ojukwu held, declaring the protracted detention of the ex-NSA in disobedience to orders of various trial courts, as “an aberration of the rule of law”. The court held that FG’s action amounted to gross violation of Dasuki’s fundamental right to liberty. 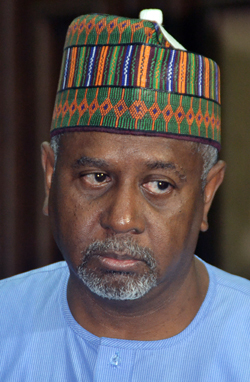 Consequently, the court granted Dasuki fresh bail to the tune of N200million with two sureties.